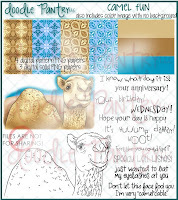 Addicted to Rubber Stamping: Hump Day! All of the paper used on this card is from Stampin' Up! (whisper white, always artichoke, crumb cake). Using my image software, I flipped the camel horizontally so he was facing the other direction. 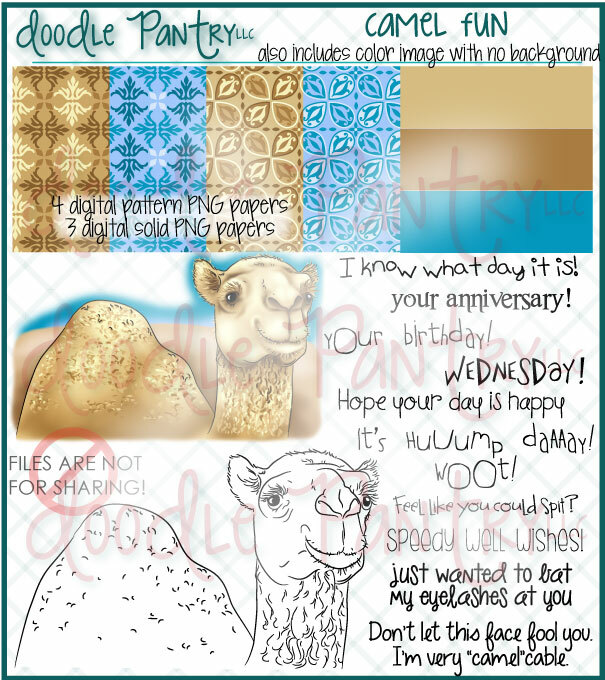 I then printed the camel on white card stock and colored him using Copic markers (E51, E53, E55, E57). I then distressed the card stock using always artichoke ink and a finger sponge. The frame is a cut file from the Silhouette online store. This particular cut file came as a card with other objects. Because I wanted the camel to appear behind foliage, I cut away the other objects and flipped the cut file vertically using the designer silhouette software. I raised the frame using pop dots and adhered it to the white card stock. I brought the sentiment into the designer software and used the print and cut feature. This was also distressed with always artichoke ink. The frame for the sentiment is also a cut file from the online store. I adhered the sentiment to the frame and raised it using pop dots onto the white card stock. Everything was then mounted onto the crumb cake card base. Oh my, this is soooo cute! Of all the animals I see on cards, I can't think if I've ever seen a camel before...lol!! Your cut file frame is a perfect accent. Thanks for joining us at Creative Cutting Challenge! So fun Susan! Love him. I instantly feel in love with your card....the foliage cut file is PERFECT! Gave it a lot of deptht and yup....looked like it was behind foliage and jungle feel. I must use/borrow you idea when I made a card with him. OMG!!! Love this card!!!! 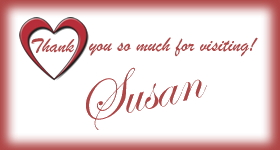 Great card Susan!!! Great card! What a fun set this is! Thanks for sharing! Super Super cute! Love the saying the camel. Woot Woot. Hump day. Thanks for joining us at Creative Cutting Challenge hope you will join us next week when we intro our new challenge. Fabulous Susan, love how you have coloured him and your fab use of the cut file foliage! Great and wonderful card! OMG Susan this is hysterical! I'll have to CASE this card for my brother who posts the commercial on his Facebook every week! LOL! Thanks for the inspiration! Thanks for joining us this week at Through The Craftroom Door and good luck! Fab card, Love the sentiment!! Me and my hubby say that!! Such a fun card - love it! Thanks for playing at Oldie but a Goodie!